I had a great time shooting the interviews on location in New Castle the winter before last, working with the incredibly passionate and dedicated film-makers Dennis Mohr and Andrew Watt. I would have been happy enough if all that it had meant was a free trip to New Castle, but it ended up being much more than that. I got to meet locals with connections to the people in my collection, explore places I couldn’t have got access to on my own and discuss — at length — ideas around mugshot photography, crime and criminality, collecting, history, celebrity and every other issue that somehow clusters around these strange little pictures. My favourite part of the shoot came very early one morning, in a bar on North Mercer street. I was sitting on a barstool, recording and re-recording the story of Martin Fobes and his role in the death of a young girl one night in 1948. We were supposed to have the place to ourselves but it turned out that the bar is used by homeless men and alcoholics who want somewhere to drink when they wake up, outside legal opening times. Every so often, there would be a knock on the back door and the barman would usher people in and whisper to them to sit quietly behind the camera. We ended up with a bunch of disreputable-looking guys at the far end of the bar, smoking cigarettes and drinking beer. Towards the end of the interview, they began to chime in with comments every time the director said cut. “Sounds like he did it,” they’d say, or “He killed that girl, you convinced me!” After we’d finished, I sat with them as they flicked through my box of mug shots, looking for people whose families they knew. They were fascinated. I passed around a bundle of printouts of posts from the website, and they read extracts to each other when they found someone they recognised. We all had a great time. I’ve never done a proper public reading of anything I’ve written, but I doubt that any audience would match that one. Anyway. “Mugshot”. On TVO. This week. 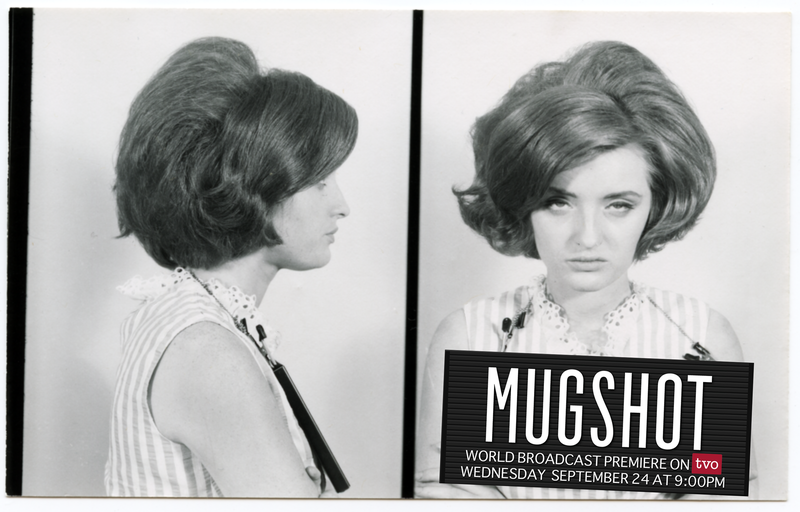 “Mugshot” is a feature documentary investigating the cultural significance of the mugshot. Originally a law enforcement tool, the mugshot has deviated from its fundamental purpose as a source of criminal identification. It has been sensationalized through celebritydom, exploited by the leniency of freedom of information, and has captivated the attention of the art world. Mugshot explores the personal stories of those whose lives have been affected by this iconic photograph. Mugshot gathers a motley crew of writers, artists and collectors whose lives have been transformed by the strange power of the mug shot. Once disregarded as photographic evidence of a crime, these tiny moments of history are now highly valued by many. Cultural and legal differences are exposed as we travel between Canada and the United States and see how these precious photos are used in historical archives, art and in tabloid culture. “Mugshot” is invited to the Hot Springs Festival in Hot Springs, Arkansas in Oct. 2014. My family lost a member by a selfish drug loaded killer punk that seems to fascinate your heart. I’m not sure I will ever be fascinated by humans that choose to victimize others. First, I’m sorry for your loss. That’s terrible. I can see why you might not want to read anything that seems to glorify criminals. But I hope that that’s not what I’ve done on this site. I’ve tried to record the lives of people who happen to have been arrested, for whatever crime, as fully as I’m able. Of course, some of them aren’t good people, and I’m sorry if, at times, what I’ve written about them might seem to have celebrated their crimes rather than simply report them. I’m sure that’s happened, and I’ll keep an eye out for it in future. However, most of the people whose mug shots I have didn’t do anything particularly bad — or, at least, only did something bad once, and were arrested and punished for it. They’re just ordinary people. It’s the place and the time that they come from that fascinates me, not their crimes. Again, though, you have my sympathies. I’ll keep in mind what you’ve said. Thanks for writing. Oh, bravo! I have so enjoyed your tales of the (small) city here. I can only look forward to seeing the film eventually, since I don’t live in Canada. Congratulations and well done. PLEASE let us know when it will be broadcast in the US!! Can’t wait to see it!! Great. I’m jealous. I’ve had some good readings, but I think you’ve got ’em all beat. Reblogging, if I can figure out how. cheers! Thanks for the reblog, Jesse! Like I say, that ‘reading’ was a great moment. Many of the shows that are broadcast on TVO are available for streaming from their website (http://tvo.org/video); it’s possible that “Mugshot” will end up there too. However, I’ve no idea whether TVO uses region blocking to prevent access from the US (or Scotland, for that matter). Thanks for the tip, Tony. I just checked, and the stream seems to be blocked outside Canada. I’d guess the documentary will be on the streaming site eventually, like you say, so anyone in the TVO region should be able to see it, even if they miss it this weekend. Hope you like it! Apparently it will be available until October 25, 2014. Outside Ontario, it might be possible to stream the video via a proxy server or VPN, but that’s something people will have to figure out for themselves. I’m from New Castle, PA. My father is one of your ‘mugshots’. You attended his 92nd Birthday party when you were filming in New Castle. He is 96 and still chugging along. How can I purchase copies of the documentary? Hi Ron! Good to hear from you. That birthday party was another of the highlights of the trip, and I’m glad to say I left with a couple of your CDs. Thanks for a great night. I have no idea how you’d go about buying a copy of the film. I guess TVO would be the people to contact. I should say, however, that I’m pretty sure that none of what we shot in the hall that night made it into the final cut — they decided to go with a couple of other stories from New Castle instead, I guess. I just finished watching “Mugshot”, which I enjoyed. If I may say so, you came across very well in your interviews and appeared relaxed and personable. As a Canadian, I appreciate the fact that we tend to be conservative in the dissemination of arrest records. In contrast, such information is freely available in many of the United States, leading to publications such as “The Slammer” which publish all the latest mugshots for the entertainment of the general public. Being arrested is not the same thing as being convicted and, as your blog has shown, many of those in your collection went on to live relatively normal lives. It appears that most of the people you have documented are no longer alive and you’ve taken some care to preserve the privacy of the others. Unfortunately once one’s mugshot is posted to the world-wide web, it’s effectively there forever and readily accessible from a Google search. Thanks, Tony. Glad you liked the film. I know what you mean about appreciating the idea of taking a conservative approach to disseminating mug shots. I tried to get a look at some old Scottish mug shots (to see if I could do a Scottish version of this project — “Wee Toon Noir”, maybe?) and it proved to be impossible. The only ones they’d let me see were from over a century ago. Annoying from the point of view of a writer, perhaps, but definitely a good thing from the point of view of anyone in the photographs! Thank you so much for the updates, I am so excited with the possibility that I may be able to view this in the future here in the U.S.
That’s great! Thanks for letting me know. I am truly fascinated by the extreme differences in crimes of today versus 1930-1960s crimes. I noticed there were so many that pertained to food, lodging and caring for children’s needs. It was impossible not to be sympathetic to some of those charged in crimes. The hard lined, etched looking faces, showing a definitive telling of a hard lived life, would belong to a 9 year old CHILD!! Those haunted eyes certainly showed abuse and neglect that in no way were ever talked about, a little less reported to an agency. Kids didn’t even get an education, they were working on farms and in factories. I still have great empathy for the true victims of crimes, but not always are victims just those whose photo was taken in a mugshot. Victims can come in many ways and forms. There is always more than one side to every story. Thank you for such a rich, historical, well thought out trip to a long lost time and place. Mr. Diarmid, your humanity and understanding is to be commended. Job Well Done, Sir. Excellently put. I can’t even imagine the poverty that some of the people in these photographs faced — not just the ones who were thrown out of work in the depression, but they probably had the hardest time. And, as I said in reply to one of the previous comments, a lot of them weren’t arrested for anything too terrible. There are hardly any murderers among them. They’re mostly ordinary people who made a mistake once, or did something stupid that they probably regretted. Thanks for writing.